Galiani Hostel is situated in the centre of Bulgaria's capital Sofia, close to the central railway and bus stations. 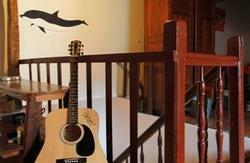 The hostel is housed in a restored 20th century building of cultural significance. Plenty of historical and cultural landmarks, bars, restaurants and night clubs can be found close by. Galiani Hostel provides various accommodation options, such as single, double, triple, and quadruple guest rooms and offer short or long stay. The hostel provides cable TV in each of the rooms, free wireless internet, shared bathroom with 24 hour running hot water, clean linen and towels, as well as a free breakfast. All accommodation units are fully heated during winter months. On site facilities include a 24 hour front desk, a tourist information, a refrigerator, a laundry, a hair dryer, an iron, maps of Sofia, board games and a storage room. There is a pick up service for those arriving by air plane, train or bus. For the moment all the trams reach our boulevard 70,Hristo Botev. So you can take any tram you decide, heading the centre, take off at the forth stop called Pirotska (the name of the street that crosses our boulevard) and right in your left you can see the red sign Hostel'. You can go on foot as well. Straight ahead from the Central Train Station, follow Hristo Botev Boulevard, pass Slivnitza bridge, and continue straight on until you reach the crossing with Pirotska street. You can see the Hostel there. Note that Central Bus Station is very close the Central Train Station. So if you arrive by bus, just go to the Central Train Station and follow the route mentioned above. as well. If you have a large luggage you need to buy two. After buying the ticket you need to punch it in the yellow/orange punching devices. Take bus ? 84 from the Sofia Airport. You will reach Vasil Levski blvd. within 25-30 min and then get off the bus. The stop is called 'General Gurko'. Walk about 5 min, heading the Monument of Patriarch Evtimii. There you can find Graf Ignatiev Str. and catch tram ? 12, heading the direction of the central train station. Get off at the stop Pirotska str., The hostel is right in the corner of the crossing. Note:Those who book long stays and the groups are offered special discounts. Trams ? : 12, 6 or 3 from the Central Railway Station, get off on the fourth 'Pirotska' stop, 15 minutes by foot. 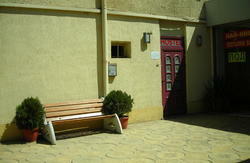 The Hostel is situated on the corner of Hristo Botev blvd. and Pirotska street. Catch bus ? 84 from the Sofia Airport, itll get You to Vasil Levski blvd. within 25-30 min., to General Gurko stop where You are to get off. Continue walking towards the Monument of Patriarch Evtimii, for 5 min. There, on Graf Ignatiev Str. catch tram ? 12, in direction to the Central Railway Station. Get off at Pirotska str. Stop. The Hostel should be within your eyesight. The closest to the Hostel, Metro stations are Opalchenska and Serdika.